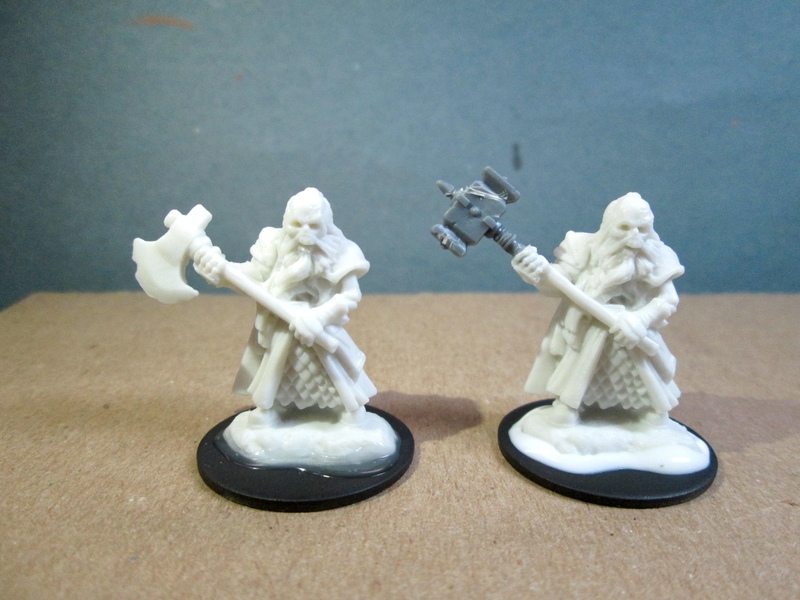 Undead Dwarf Fighter & Conversion: Bones 3 Figure | H.A.W.K.S. 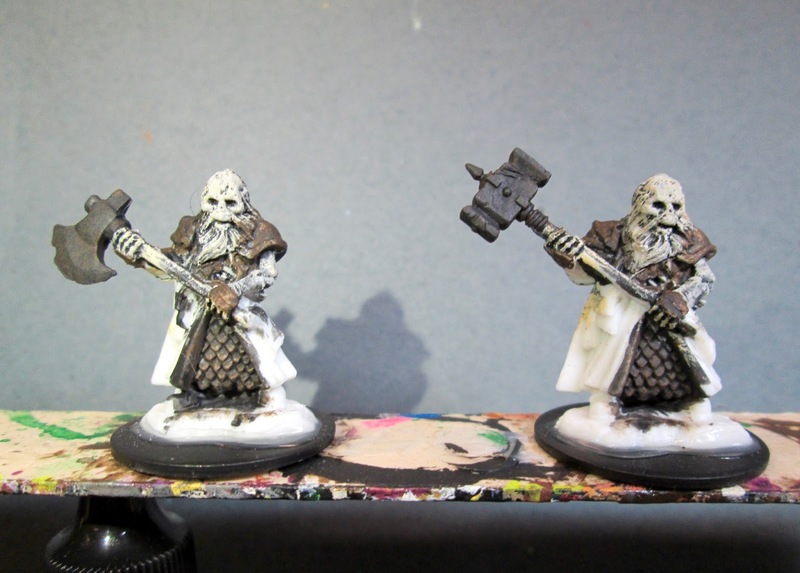 This past week I continued working on my Bones 3 Add-on Undying Lords sets, and painted the Dwarf Fighter; one basic one, and one I modified by changing the Axe to a Hammer. 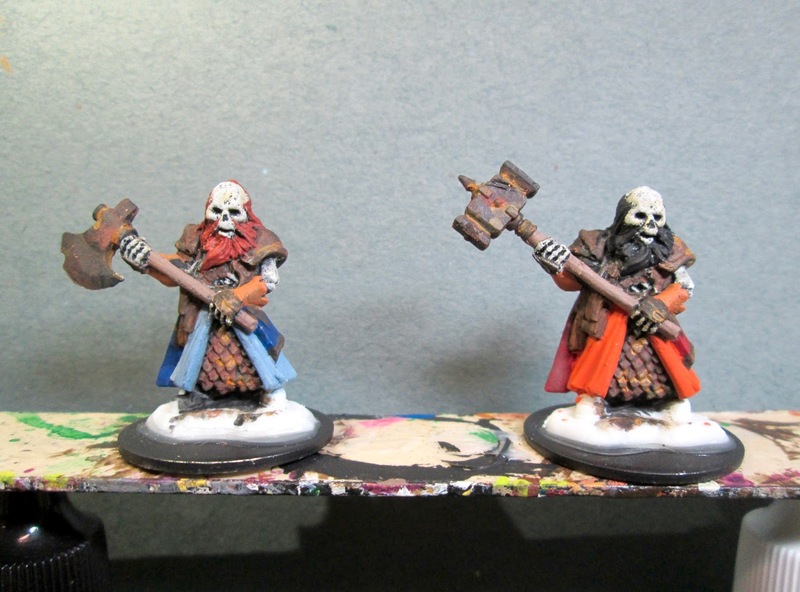 To read last weeks post where I painted my two Undead Elf Archers, click here: Undead Elf Archers. I prepped these figures in the usual way; soaking them in a dish of water with a couple drops of dish-soap added, then giving them a light scrub with a soft toothbrush, and then rinsing and drying them. I then did the conversion work, and then glued the figures to black-primed 1″ fender washers with Aleene’s Tacky glue, and then glued the washer-mounted figures to a tongue depressor with a couple drops of the Elmer’s glue under each washer. I began by painting the metal parts, and skeletal parts with Black. I then drybrushed the skeletal parts with Americana “Antique White”, and I drybrushed the metal parts with Americana “Bittersweet Chocolate”. 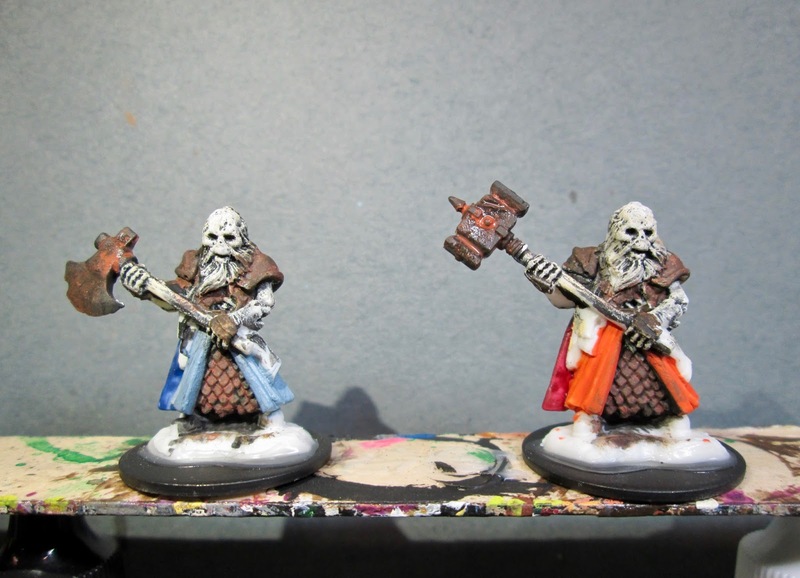 I then hit the skeletons with a light drybrushing of Crafter’s Acrylic “Light Antique White”. Next, I used some Duncan Aged Metal “Iron” to apply some reddish rust patches to the armor and weapons. 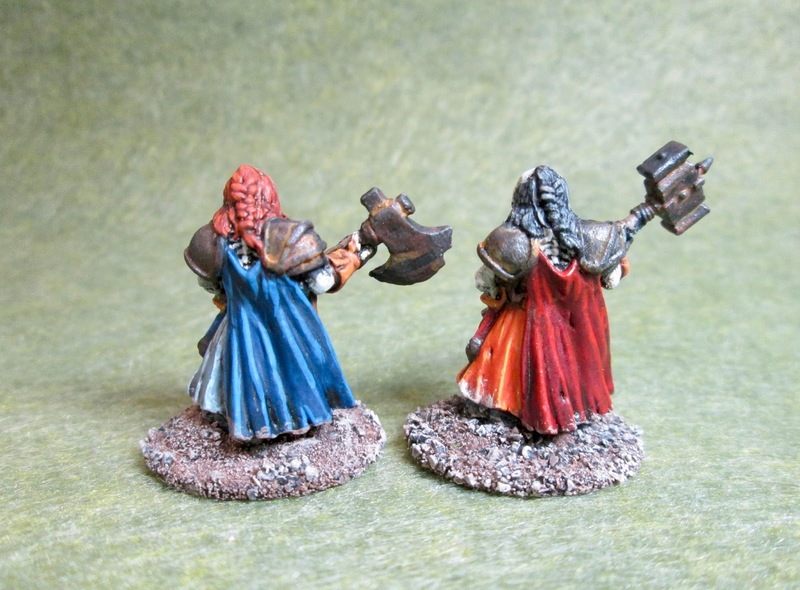 After that, I painted the left one’s tabard with Folk Art “Settlers Blue”, and cape with Crafter’s Acrylic “Navy Blue”; and the right ones tabard with Crafter’s Acrylic “Orange Spice”, and cape with Ceramcoat “Black Cherry”. Next, I painted their writ guards with Americana “Terra Cotta”, and the shafts of their weapons with Americana “Mississippi Mud”. I then painted the left one’s hair with ,Anita’s “Raw Sienna” and the right one’s hair with Black. After that, I painted their pouches, with Americana “Asphaltum” and then went back and painted their scabbards the same color as their capes. I also splotched some Accent “Golden Oxide” on their armor to add to the rust effect. I gave them a while to dry, and then I applied a wash with Citadel “Agrax Earthsahde” wash to their clothing, hair, weapons shafts, and wrist guards. When the wash was dry, I gave the armor and weapons a light drybrushing with Folk Art Metallics “Gunmetal Grey”. 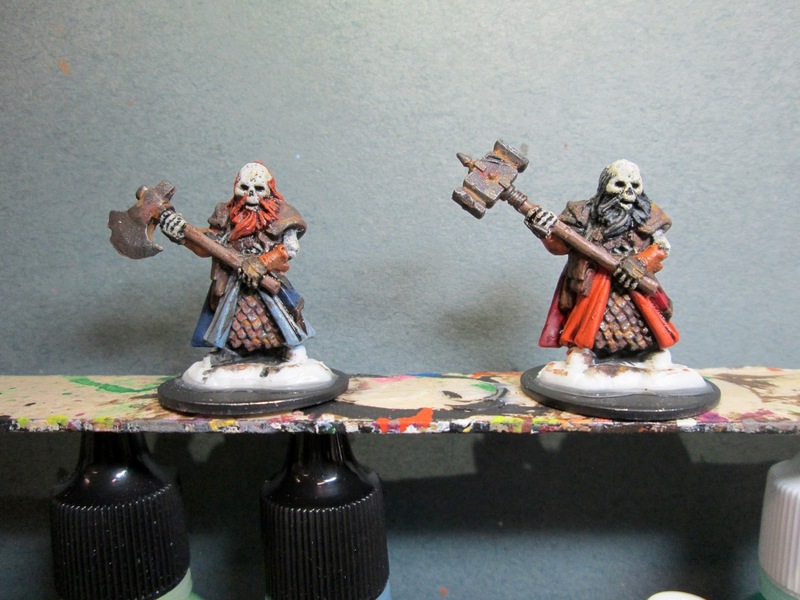 I then highlighted the left one’s beard and hair with Americana “Burnt Orange”, and I highlighted the right one’s beard and hair with Americana “Neutral Grey”. I also painted more distinct nose holes on each of the skulls. Next, I highlighted the left one’s tabard with with Crafter’s Acrylic “Cool Blue”, and highlighted his robe with Ceramcoat “Demin Blue”. On the righthand one I highlighted the tabard with Americana “Tangerine”, and the robe with Reaper MSP “Holly Berry”. I then highlighted the wrist guards with some of the “Golden Oxide”. I realized I hadn’t painted the boots; so gave them a quick coat of black, and when that was dry I highlighted them with the “Neutral Grey”. Lastly, I painted their integral bases with Americana “Charcoal Grey”. I let the figures dry overnight and the next day I gave them a coat of Americana “DuraClear Matte” varnish. Then, when the varnish was dry, I used some white glue to glue a little coarse sand to their bases. When this was dry, I painted the sand and the washer with the “Bittersweet Chocolate”. When that was dry, I drybrushed the base with some of the “Mississippi Mud”, and then some Folk Art “Barn Wood”. I’m really happy with how this pair turned out. 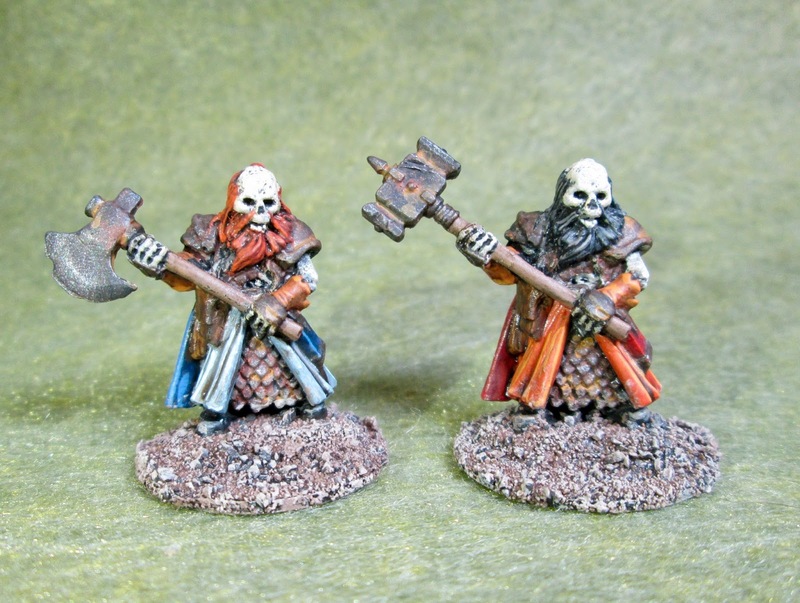 As you can see, with the realization that our Frostgrave Campaign will be coming to an end soon, and we will be heading to the Ghost Archipelago next year, I have switched the basing for these skeletons from my usual gray theme (like I used on last week’s Undead Elves) to a more general purpose grayish-brown.